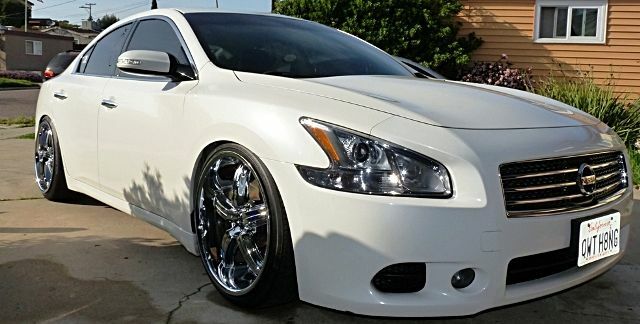 Maxus is the yearly gathering of Nissan Maxima enthusiast from all over the U.S. This year it will be hosted on the last weekend in July (27th-29th) in Houston, TX. This years events include a Judged Car Show, Urban Road Rally and of course the 1/4 Mile Contest, trophies and prizes will be handed out to competitors and winners of these events. -We will have a special "Car Meet" rate that day, $25 for 20 mins (2x10 Min sessions) during that time, you can go as much as you'd like, but I doubt you'd wanna do it for more than 4 times and not hate yourself the next day. - Basically I'll have the judges walking around then, during this time, I'll have a scavenger hunt going on with the people who are at the meet, we'll also be BBQ'ng and what not throughout the day... basically a big picnic... throughout the day. -The other meal you payed for, we'll also be handing out trophies, taking group photos, etc. -The Maxus Raffle will have donations from our event sponsor's products, list has not been finalized yet, but some of the prizes are worth $200, there are some talks of having even more expensive prizes too! More details will be discussed on the forums. -The Maxus T-Shirts will be sold at the event, no pre-sales will be taken as of this moment. -If you did not purchase a package you can purchase the ticket for the BBQ on the day of. -Extra meals can be purchased with packages only. Last edited by tigersharkdude; 05-02-2012 at 06:31 PM. I wish I could do this. Had planned on it but with the baby coming I won't be able to go now. Next year hopefully. Those prices definitely aren't bad. Are there packages for those who are local/not needing hotel rooms or is it just regular ticket price for event, etc? Working on the local yokal attendee price, right now it's @ $45, but I'm waiting on the budget man to come back with me on the "right" price. Last edited by aackshun; 03-09-2012 at 03:11 PM. As of now, I will not be offering a local attendee price. Now, as for how you split up the hotel? I don't care, there can be up to 4 people per a hotel for maxus. I will be offering extended packages for people who want to split rooms. So am I, it's going to be a straight party in my room 24/7, anyone with families, wives, girlfriends, something to loose or a fck to give should NOT be anywhere near my room. so wait... if we are local, we cant do anything but be at the meets? i dont think im following this correctly. i wanna go, but i'll probably get a hotel offsite somewhere. i'd also want to run the 1/4 mile track and get some lanyards and a shirt or two. At the general request the Hotel is now left out of Maxus, so it is up to you guys to find Accomodations in Houston, we will help out the best we can to aid your decision making (So you won't stay in a craphole) but we're no longer requiring that you stay at the Omni Hotel. looks like i wont be attending. Typo from the web editor, he didn't change it from the previous package setup when the hotel stay was included. Racing package just adds $20 to the whole deal. Last edited by aackshun; 05-02-2012 at 11:29 AM. You act like Dallas is going to be that much better! It won't but I'll be inside! Lol. You will for a lot of this meet or at least in the shade. Friday is at a indoor go-kart place. Saturday is at a very wooded park. Your two meals are inside, the BBQ is saturday @ the park. Last edited by aackshun; 05-03-2012 at 04:19 PM. It's Maxus dude, you can sit in some heat for a weekend. Who knows when it'll come back! On a related note, I'm trying to get to this myself. I have a big week long event the week before, making another trip the following weekend might be tough on the fam. Hopefully it works out. Bump! I know this only applies to the 1% of maxima owners out there but it's worth a shot! Every sign up counts!!! Thursday the local road course is having a open track day for $75. It's called Red Meat Race Fuel and it's at MSR Houston. MSR Houston is a nice road course where it's typical to hit 130+ on the back straight, many events in Houston have been held there and it's a relatively flat and manageable road course w/o high banking and such. It's not a part of the Maxus package, but if you wanted to come in on Wednesday night and get some cheap road coursing in, it's always an option! We will be going to the Beach during Maxus, so bring the appropriate attire to change into on Saturday. Also bring sunblock, towels, umbrellas, beach chairs, anything you may need to enjoy a nice evening on the Gulf. The road rally will have about 125 miles and take a little over 2hrs to complete! It should take any 4th gen less than 1/2 a tank of gas to finish it. Also I suggest bringing beach going attire/supplies on this day!!!!! PS. Can a mod move this to the regions section? Thanks!